William John Lawrence Sharman (No.23 in the list of male British team members) was born on 12th November 1939 - within the sound of Bow Bells, making him a TRUE Cockney. Early on in his life he enjoyed cycling, albeit not competitively but just for fun. Around the age of 16 it was suggested to him by his friend and next door neighbour, John "Dai" Davis (who would himself go on to become an international judge and manager of the British team) that they go roller skating to the Alexandra Palace rink. Tagging along Bill soon found out that he was not too bad at it and in fact he could hold his own with some of the more established skaters of that time. In 1958 aged 17 he joined the Alexandra Palace club and a year later was racing for them in the British Inter-Club Relay Championship alongside Charlie Applebee, Frank Godfrey and Cyril Cooper. By default the team qualified for the semi-finals but would progress no further, however, Sharman was suddenly someone who people were starting to notice. In 1960 an incident occurred that would shape Sharman's future within the sport. Larking around waiting for the doors to open at the Alexandra Palace rink with his friends Sharman was doing a "balancing act" along the handrails that graced the entrance. As the doors opened a member of the rink staff saw Sharman and asked that he accompany him to the rink manager's office. Expecting a reprimand he was shocked to learn that the rink manager thought his antics so "serious" that he was banned from the rink. Effectively this now meant that suddenly Sharman was without the ability to train on a rink with his fellow team mates. It is a common saying that "things happen for a reason" and in this instance one could be forgiven for thinking that this was the case. Sharman still lived with his mother in provided housing and some time before this incident they had been forced to move to Brixton and were housed about a half mile away from the Brixton rink. Being so close it was only logical that Sharman joined the local speed club, South London, a club borne from the ashes of the Brixton Falcons. Run by Johnny Ellis, in the club at that time were the youngsters John Folley and Ron Hawkes. Unbeknown to the trio back then all would become British internationals with varying degrees of success, but that was still some years away. "Semi Final 1 - 1st Sharman 1:23.8, 2nd May 1:24.0, 3rd Stride 1:24.0, 4th Jennings. One of the best races of the evening - after May had led up to three laps to go, Sharman made a very neat pass, catching May by surprise, to gain an excellent win." "At the start it was May, Sharman, Woodley and Ellis. The pace was extremely fast and Sharman was really pressing May, trying to repeat his semi-final trick - but May was too wily to fall for it a second time. When it looked as if young May was set for his first title, he was badly bumped by an over-eager Sharman and passed by the field. Woodley seized this unexpected gift and skated through to stay well up on a game Ellis. Sharman, who finished third, was disqualified." To this day the result rankles with Sharman who believed it was he who was fouled first (albeit believing it to be Woodley and not May). Granted, his disqualification came from his "retaliation" but it he firmly believes that it was the initial foul that cost him his first title. That wouldn't come for another five years. In 1962, there was some consolation when South London (Sharman, Hawkes, Folley and Ellis) won the Inter-Club Relay Championship on Brixton. The Midland team, which at that time could quite possibly have beaten any other quartet in the world, was disqualified in the semi-final, leaving the way open for a new name on the Burgoyne Shield. Sharman began to grow in stature on the speed skating scene and in 1963 he was invited to take part in the trials for the British team. Unfortunately for Sharman, funds were limited and he had to decline the offer. That year the British team went to Nantes and came away with two World titles (Danny Kelly in the 1000 metres knockout and Leo Eason in the 10000 metres). An opportunity had gone begging. In 1964 Sharman was adamant he would not pass up on that opportunity again. On 15th February he secured his first major individual domestic medal with a third place in the One Mile Championship on Alexandra Palace. Later that year, in September, Sharman would take part in his very first World Championships on the road in Madrid, Spain. Soon after arriving Sharman was struck down with a stomach bug and his first taste of major international competition saw him perform well below par. His highest placing was 7th in the 5000 metres. In fact, as a team, Britain as a whole were well off the pace and it was the first major championships since 1949 that as a nation we did not take a medal of any colour. Even defending 10000 metres Champion, Leo Eason, could only manage a highest placing of sixth in that event whilst all his other performances were well outside the top ten. By the time the World Championships next came around in 1965, Sharman had established himself as a team regular. 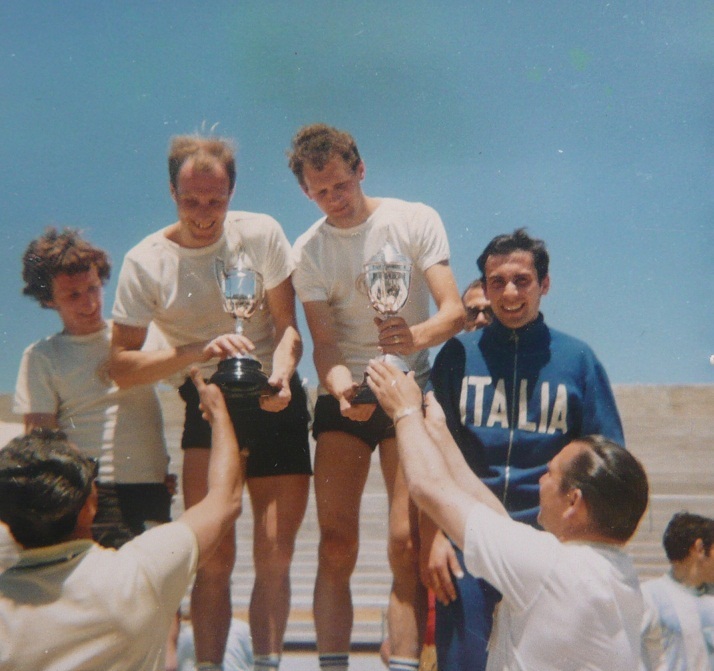 There were two World Championships that year, the first in July in Wetteren, Belgium (road) and the next in September in Siracusa, Sicily on the track. Sharman would go to both, but he very nearly didn't. In Wetteren Ricky May was the only medallist (silver in the 5000 metres) whilst Sharman would finish 5th in the 20000 metres. The final event, the "Coupes des Nations" relay saw Sharman paired with his room mate, Danny Kelly, and together they would go on and win the event. Whilst it was to be Kelly's swansong internationally it was Sharman's first taste of international success. Shortly after returning home Sharman and some other skaters were invited down to Brighton to watch a film that had been made specifically about skating. During a break the group played a game of football on Brighton Beach. For anyone who knows the beach, you will know that it is not sandy but rather has large pebbles, some of them the size of footballs themselves. It was one of the "pebbles" that Sharman deftly kicked in place of the ball and in so doing broke his big toe. He sought medical advice from a local doctor explaining that he was due to compete in the World Championships in September but the doctor said that there was nothing he could do and his advice was that he shouldn't go. This was not what Sharman wanted to hear of course and ignoring his doctors advice simply cut his boot to allow room for his swollen and somewhat painful big toe and boarded the plane for Siracusa. Despite his apparent handicap Sharman produced his best international performances to date. Three out of four of his placings were top ten with one of them being silver in the 20000 metres. Quite remarkable when you consider he had never skated a banked track before never mind the broken big toe. In the same event his team mate, Ricky May, was 3rd. Sharman maintains that it was May's indecisiveness that cost either of them the gold medal, but the truth is we shall never know. That said, the pair did go on to place in the "Coupes des Nations" relay. Sharman's other result, 16th in the 1000 metres knockout could almost be forgiven as in one of the early rounds he came up against a young Italian also relatively new to the international scene - Giuseppe Cantarella - who would go on and win the event. In January 1966 Sharman was again 3rd in the British One Mile Championships, this time on the Birmingham Embassy. On 28th May, however, he finally achieved his goal of British Champion when he won Half Mile Championship on the recently opened Mecca Olympic rink in Springhill, Birmingham. The floor was not the usual wooden floor found on most rinks, but moreover was a new state-of-the-art composite floor, and whilst many skaters didn't take kindly to the surface, Sharman loved it. Unfortunately, in what was probably Sharman's best domestic season, the NSA decided not to send a team to Mar del Plata, Argentina, for the World Championships that year citing cost as a major factor. It was the first time the World Championships had been held outside of Europe, and Britain were not part of it. 1967 was to be another pivotal year in Sharman's skating career. The Brixton rink was closed down and sold to a carpet wholesalers and with the rink went the club (although South London Roller Speed Club would officially cease to exist in 1968). But whilst John Folley would join the Alexandra Palace club Sharman joined North London. Being a man of principal he refused to entertain the idea of joining the Palace due to the incident of him being banned from the rink several years earlier. Of course, it wasn't the club he was banned from but the rink itself, but Sharman feels that the club did nothing to fight or support his cause and that stuck with him. So, North London it was, where his old friend, "Dai" Davis was also a member. On April 8th and now skating for North London, Sharman went on to win the second of his two British titles, the One Mile on Alexandra Palace. Sharman's skating style is not one that many would describe as "tidy". In fact, early in his career he was once described as a "windmill" by one skater, but none could argue that it was effective. His speed, sheer presence and the fact that his style made it extremely difficult to pass won him races. That year there were no World Championships (for men that is) but the very first "independent" European Championships were held in Inzell, Germany, in September. Sharman would have top ten placings in all four events, his highest placing being 2nd in the 10000 metres, with Jurgen Traub (Germany) just pipping him to the line by inches. The trip was also like a South London reunion, (for the men at least) with Folley and Hawkes making the team and the only "gate-crasher" being Derek Blake, now of course skating alongside Sharman at North London. The trip was also notable for the fact that Henry Crystall had stepped aside as national team manager in favour of Bob Halford. Whereas Crystall, despite his years in the sport, was a controversial character and thought to be ineffective as a manager, Halford was the other end of the spectrum and had the total respect of the skaters he cared for. In 1968 Sharman again made the national team for the World Championships in Montecchio (Vicenza), Italy. As with his domestic season his international results were fairly mediocre by his own standards with 6th being his highest placing in the 1000 metres whilst all other results were outside of the top ten. In 1969, however, Sharman saw a return to form. In April he would place 2nd in the Southern Counties and 3rd in both the Half Mile and Five Mile Championships. Sharman always maintained that the Five Mile was the one just out of his reach. Had it been a straight final he feels he may well have medalled more than he did, but the fact that there were heats first meant that he was generally just too tired for the final. 1969 would be the first and only time he would get a medal in the Five Mile Championship. 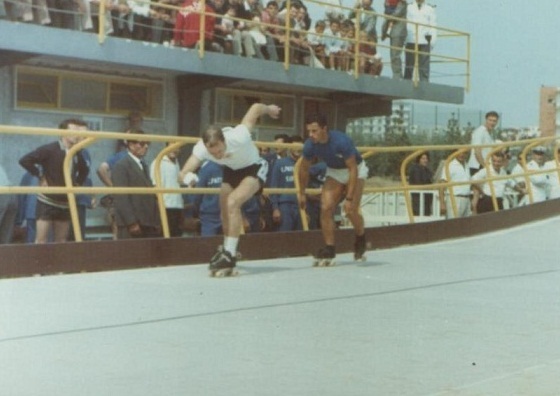 The World Championships were late in 1969 in Mar del Plata, Argentina. In fact, with them being in December it meant that they were scheduled at the start of the 1970 season in Britain. Sharman was again in the team, as he had been every time since 1964. This was his, and Britain's, first venture at a World Championships outside of Europe. The Championships were to be on the newly built banked track next to the River Plate football stadium. Sharman had only skated one banked track before and that was Siracusa back in 1965 where he did so well. In the lead up to these Championships Sharman and the rest of the British team trained on the wooden 200 metre banked running track at RAF Cosford - and it paid dividends. "On the last lap I was tracking John all the way. We were both behind the two New Zealanders and I was waiting for John to make his move. Suddenly he dived between the two Kiwis and although I tried to follow they shut up shop and it was all over. I'd missed the pass. For sure had we both got through I'd have raced John to the line. After all, it was a World Championship and opportunities don't come round that often. John won it well, though, and I was so pleased for him. Whilst we were all skating as individuals we were also still a team. Whilst it hurt me to think I still hadn't achieved my ambition I wasn't jealous of John. He deserved it and it was a fantastic achievement". Sharman and Folley went on to win the "Coupes des Nations" as well as having some success before returning home in local races after the Championships. Little did Sharman know but with no more World Championships until 1975 that would be the last time he would skate a major international competition. On his return home he had started to slow down with regards to training. He was now 30 years of age and looking for other things to do. He had always been a keen cyclist and he was starting to spend a bit more time on his bike. 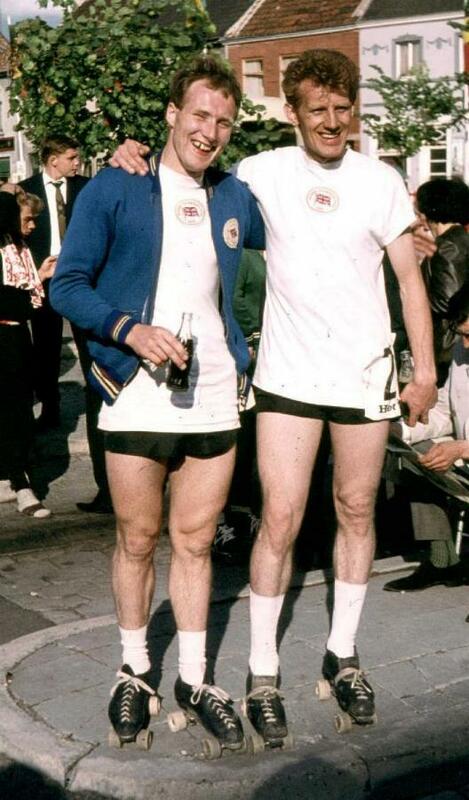 Despite this he still managed 3rd in the One Mile Championship in March 1970 on the Alexandra Palace rink. Shortly afterwards he again donned a British jersey for one last time when he took part in a 'B' international in Inzell, Germany. He was reunited with the "Argentina" team of Mick McGeough, John E. Fry, John Folley and Bob Halford as manager for one last time. After the event each of the British team was asked to sign a photograph of them skating in unison on the Inzell track. Notably, Sharman signed the photograph "Bill Sharman - R.I.P." Sharman has on more than one occasion been described as impetuous. His "retaliation" against Ricky May in the Half Mile Championship back in 1960 could alone possibly justify that statement, and this was just another spur of the moment decision he took to move on. Without a backward glance Sharman left the sport of roller speed skating and went to pursue other avenues in his life, eventually becoming a successful businessman. He has no photographs of his skating career and his medals and trophies are stashed away somewhere gathering dust - those that he still has that is. But he does still have his skates, even if they are in a bag "somewhere". In the mid 1960's Sharman was given the nickname "Silver Bill". It is unclear where the name came from but many people thought it apt (none more so than Sharman himself) and it stuck. Of course, when you dig deep into his career there are gold medals aplenty, notwithstanding his two British titles, but for some reason, possibly his international achievements, the perception is that Bill Sharman was always the "nearly man". But whatever he is, or people think he is, he is definitely a British skating legend.